An Attractive, Secure and Unique Space Infrastructure. Satellite communications is a growing global market with many opportunities and the event reinforced Australia as a global player through its attractive, secure and unique space infrastructure. Adding a global touch to the event, NewSat invited one of the worlds leading satellite communications experts, Marc LeGare, Chief Executive Officer of Texas-based Proactive Communications, to discuss the global satellite industry and the militarys growing demand for secure, mission critical satellite communications. 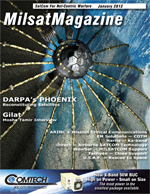 As 75 to 80 percent of the U.S. Department of Defence satellite consumption is supported by the commercial satellite communications arena, Proactive Communications mission is to provide reliable and secure enterprise-class communication capabilities to government agencies, military, and corporate entities around the world through a partnership with NewSat. Since 2004, Proactive Communications has supported U.S. Army operations in the Middle East. Proactives operations in the Middle East rely heavily on satellite communications. Almost everyone on the U.S. side, and from my experience in the Middle East, even the coalition forces have access to the open Internet for various purposes, whether its for moral welfare and recreation, telephone, or for unclassified research, and it is all provided by satellite communications. Another great thing about satellite telecommunications is that in some cases the visible signs of the antenna system cannot be differentiated from other commercial customers. said Mr. LeGare. At U.S. Foreign Operating Base (FOB) locations, reliance on communication technologies is crucial, as soldiers, emergency staff, medical technicians, firemen, electricians, construction builders and other various resource providers need to communicate to the camp commander and beyond. As they all use a variety of communications systems, Proactive Communications works towards providing a system to seamlessly tie together all communications services so that communications run smoothly between camps and the support headquarters. While discussing this process, Mr. LeGare stressed the importance of satellites for the integration of camp communications. The process involves turning data, usually in the form of radio signals, into IP data streams via Internet Protocol addresses, which are then backhauled over the satellite to a Teleport, such as NewSats in Adelaide, and then back to another base, or to the home country. Where there are soldiers, there will be a need for satellite communications, Mr. LeGare said. Moreover, in his business, there are many advantages of using Australian Teleports. According to Mr. LeGare, Australia is politically stable, geographically viable, and economically competitive. The element of national power that Australia has is the geopolitical position relative to a very complex, chaotic region of the world. Australia is safe, reliable and trusted and we share a common legacy. Australia also has the correct space infrastructure, with a range of satellites that can be seen from South Australia. I think these are some of the main things that Proactive Communications has discovered here, through our partnership with NewSat in Adelaide. he said. Proactive Communications had to weigh its options when selecting a Teleport that would meet its customers growing requirements. From America, they could go to the East, to Europe, and be one of many and be almost undifferentiated from their competition, or they could go to the West. What we did is we went to the West and what we found was a politically stable ally. We found a geographically optimal location here in South Australia where we were able to see from the Pacific rim of the United States all the way to Africa and Eastern Europe. Also, what we found out over time with NewSat is that it has the best radio frequency and sales and engineering team that we have ever worked with. It has a technically responsive, very flexible management team which accounts to PCI growth, Mr. LeGare said. There is an ever increasing demand for high quality bandwidth via satellite in the military. In the future, Mr. LeGare predicts that every soldier will be linked into a communication network of fellow soldiers and political allies, which will enable overseas missions to run smoothly and efficiently. The U.S. soldier of 2016 is going to have to rely on data fusion, knowledge management, dynamic targeting and persistent Intelligence, Surveillance and Reconnaissance (ISR). All this data gets communicated via satellite. This makes for a growing, competitive market. For a team such as NewSats, they can put together an entire delivery chain, from the Teleport to the satellite, to taking care of the customer out in the field  this is an exciting time, concluded Mr. LeGare. According to Mr. LeGare, NewSats Satellite Seminar marked an important milestone for the Australian satellite communications industry, which is distinguishing itself on the global stage.